As posted previously: Redbox offers free rentals every Monday. You can get your own weekly code by signing up with their email! Don't know what redbox is?? 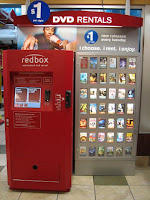 Redbox is a vending machine for DVD rentals. Located at McDonalds and various grocery stores across the USA. You need a credit card to rent a movie. You do not need to do anything online in order to rent a movie from Redbox. Returns can be made to ANY Redbox machine. Yes, you can rent your movie around the corner but return it down the road. Yes, you can rent your movie in NorthCarolina and return it in Virginia. Go here: redbox to find one in your town. Every Monday, they email a "free rental for Monday only" code. The list below contains codes that might give you a free rental! I say 'might' b/c some of the codes might be expired and some may only work in certain areas of the USA. The code will allow for ONE free rental. Not a BOGO, but a completely free rental. Each code will work ONE time per credit card. This means if you have 2 credit cards (each with a different credit card number), then you can use a code 1x on each card. Even though Redbox will allow you to rent a video online (to pick up at location of your choice), you can only use the free rental codes at the actual Redbox machine. Using a code is easy: When you approach a Redbox machine, there will be 2-3 big rectangles on the screen. In the bottom left corner will be a rectangle that says "rent with free code" (or something like that). Touch that rectangle and enter the code. The machine will process the code and either accept/reject it. If it accepts, continue on thru the menu and choose a movie. In the end, you will see your total is $0. If you forget to put in the code in the beginning, you will have another chance to enter the code after you choose your movie. On the checkout screen (where you will see your total), there is a button marked "enter free code" (or something like that).